Hitherto just a number, but is it possible that Titanic's recovered victim No.26 has finally been identified? In 2018 a collaborative effort was undertaken to re-examine the particulars of No. 26, to see if anything new could be ascertained. This re-examination hinged upon that slip of paper found in his pocket. On it was written two names and addresses. Who were these people? Could their identities reveal more about No. 26? The starting point of this inquiry began with the first of the two addresses: “Mr. Freyer, Lawrence Villa, Stephenson Rd. Cowes.” A cursory search was made to verify that the information on the slip of paper had been correctly transcribed and recorded. Immediately it became apparent that it was not. In the 1911 census, there was no individual listed by the surname Freyer residing in Cowes, nor even on the entire Isle of Wight. 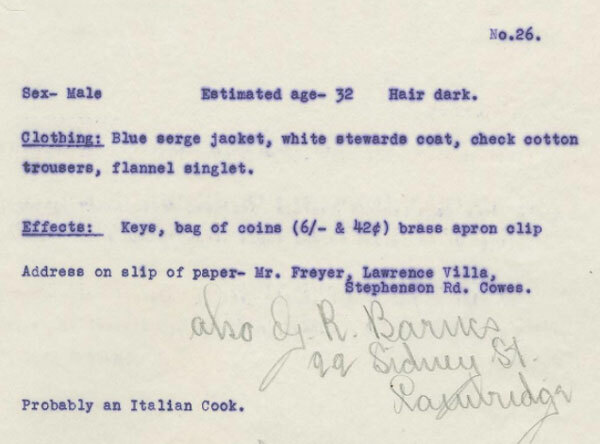 A revised search was conducted for the name Fryer, whereupon a number of potential candidates emerged as having lived on the Isle of Wight in 1911. Upon review of all the males with the surname Fryer living, one emerged as the person in question. His name was Victor Emmanuel Fryer. Unfortunately this line of inquiry was soon exhausted, as there was no information to be readily obtained about any forays Mr. Fryer may have made beyond the Isle of Wight. He was a lifelong resident. There was no record of any ships he may have served on. Only that he had experience as a seagoer and as a cook. Together, these sources provided insight into the life and occupation of Mr. Barnes. 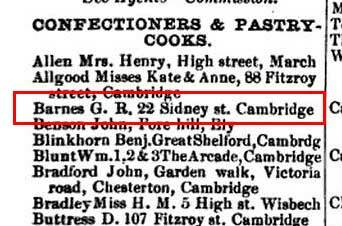 In the directory he was listed as being a confectioner and pastry cook. In the donor list he was recorded as a lifetime subscriber, suggesting he was successful at his trade. That both Barnes and Fryer worked in the culinary arts made for a compelling case that No. 26 was indeed a cook as well. Were the three professional associates? Friends? Absent something more concrete, the Cambridge connection between these two men seemed tenuous at best. A new approach was needed and a step back was taken. A survey of Barnes’s siblings and their offspring was undertaken, to seek any potential common links to Barringer that might strengthen his tie to G.R. Barnes. Instead, in rapid fashion, an answer of a different sort would be found. On April 15th, 1912, this man found himself witness to one of the most extraordinary events in twentieth century history, though he, like so many others, did not live to relate his experiences in letters and to newspapers. 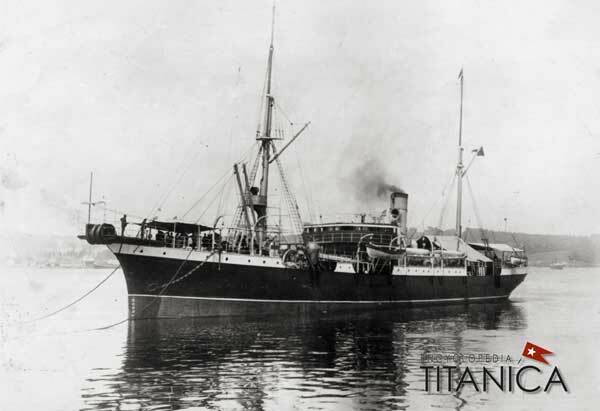 His only witnesses were the crewmen of the Mackay-Bennett who retrieved him on April 21st, 1912, just long enough to record his meager possessions in a ledger, before returning him to the sea. The man heretofore known only as No. 26 had a name. That name was Frederick Charles Barnes. Ibid. 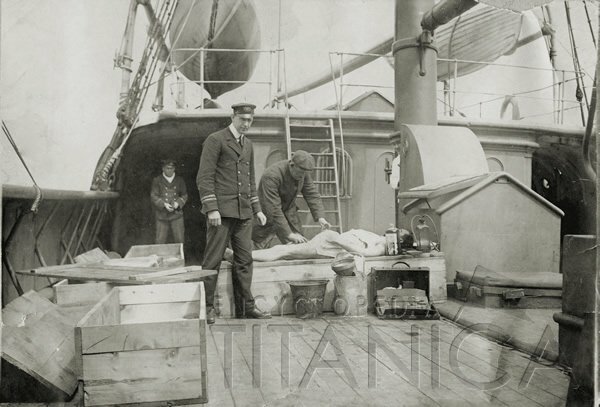 ; “List of Bodies,” RMS Titanic Resource Guide, Nova Scotia Archives, online, accessed 6 January 2018, available from . “Body No. 26 Male Unidentified,” RMS Titanic Resource Guide, Nova Scotia Archives, online, accessed 6 January 2018, available from . Crease, Diary, 21 April 1912, available from . Fryer, Victor Emmanuel, “Census of England and Wales 1911.” Class: RG14; Piece: 5690; Schedule Number: 67 Office of National Statistics, available from www.ancestry.com; Brannon, George, The Pleasure Visitor’s Companion in Making the Tour of the Isle of Wight, 10th ed. (Isle of Wight: Wooten Common, 1842), 38. Kelly, E.R., ed., Kelly’s Directory of Cambridgeshire, Norfolk and Suffolk (London: Kelly & Co., 1883), 169; Royal Masonic Institution For Boys: A List of the Patrons, Officers, Committees, Governors, and Subscribers, (Lond: McCorquodale & Co., Limited, 1903), 371. Barringer, Arthur William, “Census of England and Wales 1891,” Class: RG12, Piece: 1285, Folio: 3, Page: 2, GSU roll, 6096395, Office of National Statistics, available from www.ancestry.com. Barnes, Joe David, “Census of England and Wales 1911.” Class: RG14; Piece: 5962; Schedule Number: 296, Office of National Statistics, available from www.ancestry.com. Barnes, Frederick Charles, “UK, RMS Titanic, Crew Records, 1912,” 22-23, available from www.ancestry.com.